This baby 6505 still has plenty of bite. 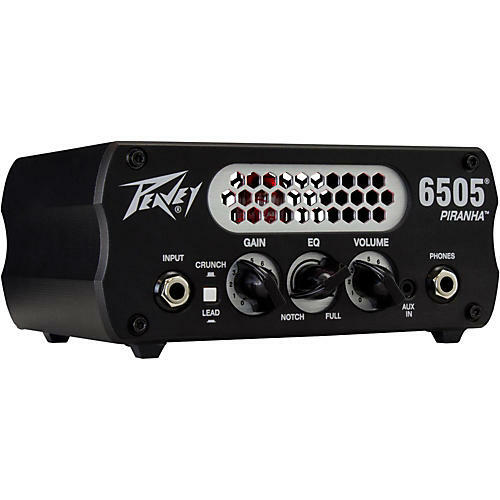 Powerful and portable, the Peavey 6505 Piranha follows in the footsteps of the popular 6505 MH mini head by packing high-gain tones into an even smaller, 20W tube hybrid power amp head. Small enough to use in a bedroom, but powerful enough for the studio, the 6505 Piranha harnesses the full gain and legendary tone of the 6505 Series. The 6505 Piranha adds a few tricks of its own, including a bright switch along with a unique "scoop" control to achieve a wide array of tones with few controls. Additional features include the 20-watt (RMS) solid state power amp, one 4-ohm speaker output, a buffered FX loop, aux. input, headphone out, 12AX7 preamp tube and tooled metal cabinet. This potent practice- and studio-tooled head offers staggeringly simple controls that feature just a gain knob, single EQ control, volume and a crunch/lead button for thicker/smoother gain. The tone control is a 3-band EQ compressed into one knob, so full left is a "10-0-7" scooped tone to "7-7-7" at the 12 o'clock setting to "10-10-10" when rolled full right.